Mr. J. Skeat, the eighteenth century author of our inspiration for the week appears to have been an important member of the catering community in Norwich, England. He details the bills of fare and the table settings for two important civic events – not dated but presumably not too distant from the time of publication of his book (The Art of Cookery and Pastery … ) in 1769. One of these bills of fare – that for the “Mayor’s Feast at Lynn”, is our topic for the day. In previous times, the bill of fare served to you at an important dinner depended on your rank. Greater choice and finer food went to the most important folk, with fewer dishes and sometimes fewer courses going to those lower down in the pecking order (those “below the salt”, so to speak.) At the Mayor’s Feast at Lynn, all guests received two course, but different choices were offered to the Mayor’s table, the Mayoress’s Table, the Common-Council Table, the Middle Table, the Large Table in the Assembly Room, and the Short Table in the Assembly Room. Interestingly, there was a greater variety of dishes at the Mayoress’s table than at the Mayor’s table at this feast. Here is the first course for both those tables (the lists also indicate the position of the dishes on the table). Take a clean stewpan with a piece of butter, when melted have some small cutlets of veal, and just warm them through in the butter; dredge in a little flour, and keep shaking it about; season them to your liking; then add a little cream, a little white gravy, and the juice of a lemon; shake them all together, and serve them up with egg balls. Banquet: a plate of cold, hairy chicken and artificially coloured green peas completely surrounded by dreary speeches and appeals for donations. I almost gave this post the header ‘Queer Gear’, as in the title of one of today’s sources – Queer Gear: How to Buy and Cook Exotic Fruit and Vegetables, (1986) by Carolyn Heal and Michael Allsop, but I thought perhaps it might attract some disappointed readers. It is a strange title, I think, considering that the word ‘queer’ was already well and truly hijacked by, or applied to, the gay community by the 1980’s. Actually it was applied in the early part of the nineteenth century, in a derogatory sense – by the 1980’s it had all but lost its negative implications and in some circles was an adjective of pride. The authors of the book clearly meant ‘queer’ as in one of its sixteenth century definitions as referring to something strange or exotic. I am not sure how they selected the vegetables and fruits for inclusion. ‘Exotic’ clearly depends on location: I guess mangoes and custard apples might have been ‘exotic’ in England in the 1980’s, but figs and horseradish and garlic – I don’t think so. I do like discovering previously unknown foods, and re-discovering forgotten ones. Previous stories have covered crosnes, salsify and scorzonera, and mangelwurzels, but there must surely be many more delights skulking in the culinary history wings. There was nothing particularly tempting to be found in Queer Gear, but it set me on the trail of looking for other sources on forgotten vegetables. I found (in the wonderful Internet Archive) The Book of Rarer Vegetables (1906) – which is surely a far less provocative title. Aubergine and artichokes may have been rare-ish in Edwardian England, but why include dandelion and horseradish? I was temporarily waylaid by Couve Tronchuda, but it turns out to be sea-kale. Eventually I selected for your delectation Scolymus and Sweet Cicely. The author then goes on to give planting and cultivation advice for scolymus, which is way beyond the scope of this blog. 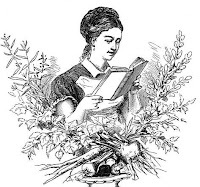 The cookery advice is a little weak, the author merely suggesting that it cooks like salsify – then referring the reader to a book on asparagus. Sweet Cicely (Scandix odorata) is a plant rarely seen in gardens at the present day, but well worth culture. It is valuable in all preparations in which the flavour of Aniseed is required. 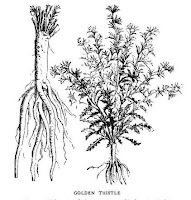 By many persons the smell is objected to; as both the leaves and other portions of the plant smell so strongly of the above herb, it is disliked. It is much more cultivated in France and other portions of the continent than in this country, and, of course, from the market point of view it cannot be termed a profitable vegetable. 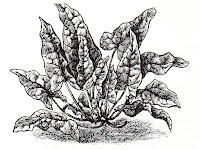 The leaves are mostly used mixed with salads, and the roots also are edible, these being used in soups and with cooked meats. Again, the author follows with good gardening advice, and minimalist cooking advice – it being merely suggested that sweet cicely roots be prepared exactly as chervil. Thankfully, he does have some more definitive advice on the cooking of chervil. Wash and brush the roots, but do not cut them. Place them in a pan, pour over them sufficient boiling water to cover them, and let them simmer for about an hour and a half. Cook the roots as above for about an hour, then cut into long shreds and fry in butter. A vegetable garden in the beginning looks so promising and then after all little by little it grows nothing but vegetables, nothing but vegetables. The final extract from this week’s source – the charming little Books and My Food (1904) - is particularly appealing to me personally as it includes two of my favourite things - Jane Austen’s novels, and pies. For an excellent pigeon-pie for a small family singe and draw three birds, split them down the back, wipe with a clean cloth, but do not wash. Fry half a dozen slices of salt pork and brown the pigeons in the pork-fat. Then put them in a deep baking-dish, slice a small onion, brown in the hot fat and add a pint of stock and a tablespoonful of flour. Stir until slightly thick, then strain over the pigeons. Cover them tightly and cook for two hours in a moderate oven. Remove the cover and replace it with one of pie-crust. Bake until brown. Today’s extract from Books and My Food concerns soup – a very serendipitous topic, as it allows me to mention to you that my book Soup: A Global History (Reaktion Press) is now under production, and should be ready for the shelves at the end of the year. For January 7th, Elisabeth Luther Cary chose a line from Epistle III, by the English poet and librettist John Gay (1685-1732), and a recipe for a clear soup base or consommé. The stand-by for soup is a simple consommé which may be multitudinously varied. Cut up two pounds of lean raw meat, beef or veal, and ad a cupful of cold roast beef cut in pieces. Put over the fire with a cracked knuckle of veal, four quarts of cold water, two onions, one carrot, two stalks of celery, six peppercorns, a spoonful of salt, six cloves, and a few herbs. Cook slowly all day. Strain and when cold skim off the fat. Add the white and shell of two eggs. Bring to a boil and boil ten minutes. 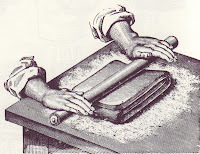 Strain through a cloth. John Gay, The Beggar’s Opera. Act ii. Sc. 2. The traditional fare today, which is ‘Twelfth Day’, or the Feast of the Epiphany (according to the Christian church calendar) – is one or other variation of a Twelfth Cake. The author of Books and My Food, our source for the week, chose a rather different ‘cake’ for her entry on January 6th. Croquettes of salt codfish are a pleasant variation of the familiar codfish cake. Make a thick cream sauce. Stir into it a pound of salt codfish shredded with the fingers after it has soaked two hours in warm water. Add a dash of red pepper.Do not cook the fish and the sauce, but allow the mixture to get cold and firm. Then shape into croquettes, dip each in beaten eggs, then in fine cracker-crumbs, and fry in very hot fat. I have long been confused as to the difference between a croquette and a kromesky. Much as I love it, I am not totally convinced of the authority of The Oxford English Dictionary as a culinary reference tool, but here is what it says about the two. Kromesky: is derived from the Polish kroméczka, meaning ‘a little slice.’ The OED defines it as ‘A croquette made of meat or fish minced, rolled in bacon or calf’s udder, and fried’, and gives as its first source the one-time chef for Queen Victoria, Charles Elmé Francatelli’s Modern Cook (1846). I always thought that the essential difference was that kromeskies were dipped in batter before being fried, but it appears that this is not essential to the definition. What do you think? A random thought on battered things: does ‘Mars Bar Kromesky’ sound more tempting than ‘Deep Fried Battered Mars Bar’? Today I continue the theme for the week, and give you the January 5 entry from Books and My Food (1904) by Elisabeth Luther Cary. On this day Cary takes as her inspiration the idea of ‘cakes and ale’, via the well-known quotation (given below) from Shakespeare’s Twelfth Night. The phrase ‘cakes and ale’ as a metaphor for earthly pleasures is generally attributed to Shakespeare, but it is in fact a great deal older. It appears several times in a version of the ancient Egyptian ‘Book of the Dead’ – a funerary text (actually a roll of papyrus) containing instructions and advice to help the deceased person negotiate the passing into the afterlife.The following extracts are taken from the version known as ‘The Papyrus of Ani’ (written in about 1240 BC), as translated by E.A.Wallis Budge in 1913. Let there be given unto me bread-cakes in the House of Refreshing, and sepulchral offerings of cakes and ale, and propitiatory offerings in Anu, and a permanent homestead in Sekhet-Aaru, with wheat and barley therein-to the Double of the Osiris, the scribe Ani. Cakes and ale and joints of meat from those which are on the altar of Ra shall be given to him [the deceased person], and his homestead shall be among the fields of the Field of Reeds, and wheat and barley shall be given unto him therein, and he shall flourish there even as he flourished upon earth. And he [the deceased] shall present as offerings oxen, and feathered fowl [geese], and incense, and cakes and ale, and garden herbs. And here is Cary’s entry, and recipe, for today, January 5th. For good little nut-cakes cream half a cupful of butter and a cup and a half of sugar; add the yolks of two eggs and beat all together. Sift two cupfuls of flour into which has been stirred a teaspoonful and a half of baking powder. Add to the butter, sugar, and eggs a cupful of milk, and then the flour. At the last stir in a cupful of chopped pecan or hickory nuts and fold in lightly the whites of the eggs, beaten to a stiff froth. Bake in patty pan[s], ice and sprinkle chopped nuts thickly over the icing. Today is also the 11th day of Christmas, which you can read about HERE. Today’s aspiring food writers have a real challenge in finding a new spin on any food-related topic. It seems that every approach, every angle, every theme has been used before – and multiple times at that. Lucky were the cookbook writers of over a century ago, when the genre was still in barely out of its adolescence, and there were still many avenues unexplored. One author with a new idea was a certain Elisabeth Luther Cary, who, in 1904 published a book of recipes inspired by the written word. Regular readers will be aware of my fondness for menu and cookery books with a day-by-day theme. Books and My Food is one such book. I have decided that it will be my source for the week – and challenge you to be inspired to remember or create your own recipe ideas from the same short quotations. With a bit of luck, we may find some reading inspiration too. Before we get to Ms Cary’s literary reference and recipe for January 4th, here are some of her preliminary comments. DINNER-ROLLS are made as follows: Add to a pint of milk, scalded and cooled, a table-spoonful of melted butter, a teaspoonful of salt, half a cake of compressed yeast dissolved in a very little lukewarm water, and six cups of flour. Mix into a sponge and cover. When light, pull off pieces about the size of a large egg, knead each of these into a smooth ball, then roll between the palms of the hands into a long roll about the size of a finger. Place close together in a biscuit pan and when light bake fifteen minutes in a hot oven. Today is also the 10th day of Christmas, which featured in a previous blog post HERE. On this day in 1955, luncheon vouchers were introduced to Britain on a new, enlarged scale. The concept of employers providing lunch for their workers was not new in Britain, and many companies did provide their employees with vouchers, but the individual systems were an administrative nightmare for individual firms to manage. A man called John Hack saw this inefficient system in operation, and realised an opportunity. He set up a company to provide vouchers and manage the system for employers, with clients and caterers paying a fee for the service. The British government backed the system by exempting the vouchers from National Insurance Contributions and tax concessions – and the rest, as they say, is culinary history. Here is a nice 1950’s luncheon dish, from The Times of August 13, 1956. Boil two pounds of spinach, drain and press well. Sieve. Have ready half a pint of béchamel sauce made from one ounce each of flour and butter and half a pint of seasoned milk. Add the spinach purée, mixing thoroughly. Stir in two beaten eggs and a tablespoonful of cream, season with salt and pepper and a grating of nutmeg. Turn into a well-buttered ring mould. Stand in a roasting-tin on a doubled piece of paper, surround with boiling water, lay a piece of buttered paper over the top and cook in a moderately slow oven until firm to the touch, 30-40 minutes. Turn out onto a hot dish and fill the centre with a salpicon of mushrooms. Cook a dessertspoonful of finely chopped onion in three-quarters of an ounce of butter for a minute or two, add 6-8 ounces of mushrooms, peeled and quartered, and cook briskly for 4-5 minutes, shaking the pan frequently and adding a squeeze of lemon juice. 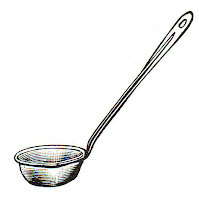 Draw aside, mix in a dessertspoonful of flour, three-quarters of a gill of vegetable stock, and half a gill of sherry. Bring to the boil, season well and boil rapidly until creamy; use at once. Be sure that the spinach purée is thick. If it is watery the ring will flop and run when it is turned out. The spinach will sieve more easily if the stalks and any coarse leaves are torn off the central rib before cooking.